Sonic Explorers takes students on a journey discovering the world of acoustic ecology with new technologies, science and creativity. Participants will explore rainforest soundscapes and learn how we can monitor environmental changes through sound. 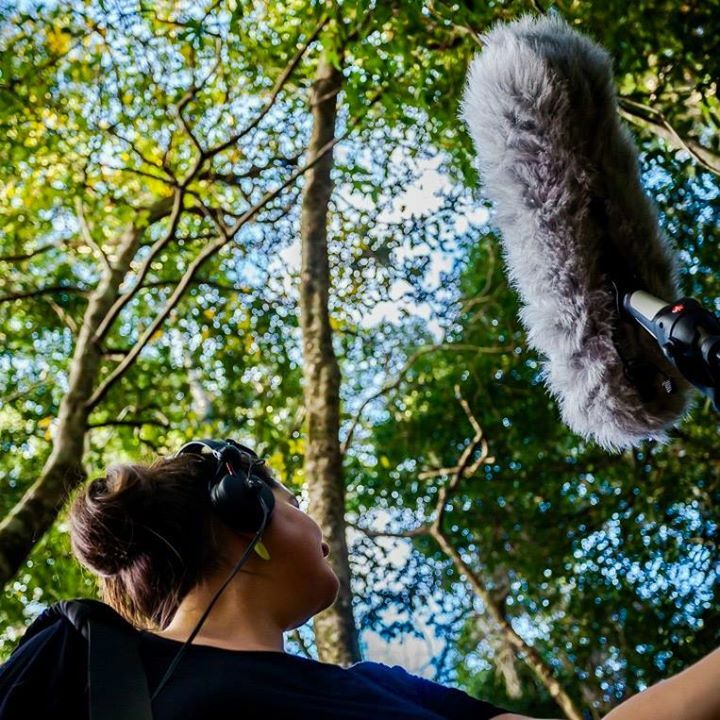 Sonic Explorers will select recording locations and set up live streams in the rainforest. 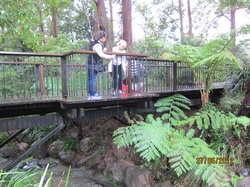 We will listen to other rainforest live streams on a sound map and create graphic scores of our rainforest sound walks. In this workshop, students learn about the new technology and exciting science behind acoustic ecology and ecoacoustics. We will go on a environmental field recording expedition in the rainforest with special microphones designed to mimic human ears. Sonic Explorers have been working with the River Listening project in Queensland, Australia. River Listening is a research collaboration between independent artist Dr. Leah Barclay and the Australian Rivers Institute to explore new methods for acoustically monitoring four Queensland river systems: the Brisbane River, the Mary River, the Noosa River and the Logan River. The project has involved the establishment of site-specific listening labs to experiment with hydrophonic recording and sound diffusion to measure aquatic biodiversity. Sonic Explorers have been running workshops and listening lab with young people across Queensland. The new sound maps will be released in 2015. In 2014, The Australian Rivers Institute (ARI) and Dr. Leah Barclay were awarded a prestigious Synapse grant to support the development of River Listening. Synapse is an initiative of the Australia Council for the Arts and the Australia Network for Art and Technology (ANAT) that supports collaborations between artists and scientists in Australia. SONIC EXPLORERS INVITED TO ISEA2012! This September 19 – 24, the world of art, science and technology come together in Albuquerque, New Mexico for a six day, international conference, kicking off a season-long exhibition and public programs. 516 ARTS and partners present ISEA2012 Albuquerque: Machine Wilderness, the 18th International Symposium on Electronic Art, exploring the discourse of global proportions on the subject of art, technology and nature. 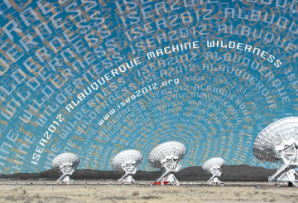 The ISEA2012 title “Machine Wilderness” references the New Mexico region as an area of rapid growth and technology within vast expanses of open land, and presents visions of a more humane interaction between technology and wilderness in which “machines” can take many forms to support life on Earth. sonic explorers founder Leah Barclay will be facilitating sonic explorers workshops at ISEA 2012 in addition to presenting a paper on outcomes of her doctoral research. Barclay will also be speaking on a panel with Ricardo Dal Farra, Andrés Burbano, Nina Czegledy & Roger Malina about artists responding to ecological crisis. Over 100 artists and 400 presenters are coming from 30 countries to present and/or exhibit at ISEA2012. The International Symposia on Electronic Art have become the most important academic gatherings on electronic art world-wide, bringing together the worlds of art and science. The next conferences will be in Sydney, Australia and then in Dubai. Don't miss this expansive, international event in the United States for the first time in six years. “Sounds are pressure waves travelling through a medium like air and water. If there is air, sounds are ‘here, there and everywhere’ with or without our consciousness. Sounds generally are characterized by pitch, loudness and timbre. For pitch, humans normally can perceive from the lowest of 20 Hz to the highest of 20 kHz frequencies. The ultrasounds above 20 kHz are inaudible to humans, however, some animals like bats and dolphins can even use them. I particularly prefer low frequencies like bass sounds, which are sometimes more felt than heard. Interestingly, babies feel comfortable when they hear the low sounds from a vacuum cleaner, because it reminds them of the time and place when they were in their mother’s womb. If a sound source increases in loudness, it is perceived as approaching. Changing the amplitude of a sound source is a simple but effective way in a sound production process to differentiate the distances of the sound sources. Also, reverberation, the ratio of direct to reflected sound, is an important factor related to the space that the sound is in. When we hear a sound, the particular place such as a living room, bath room, train or on the street will affect this. We can also comprehend that some sounds are dark or warm, while other sounds are bright, harsh or mellow. These are examples of the timbral characteristics of sounds. I think it is important for young people to explore the sound world. If they take time to actively listen to the sounds around them, they will be surprised by the variety of sounds and the different sound characteristics. It will be meaningful for young people to take the opportunity to engage in sound workshops, which can help them to learn how to appreciate the various qualities of sounds. To experience the sonic world around them can also be a good part of their emotional development.